French President Nicolas Sarkozy has announced his country is to return to Nato's military command, reversing four decades of self-imposed exile. 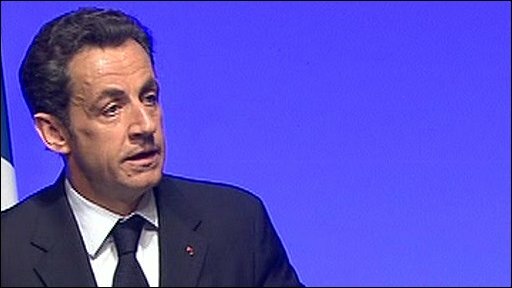 Mr Sarkozy confirmed the decision in a speech to defence experts at the Ecole Militaire staff college in Paris. President Charles de Gaulle pulled France out of Nato's integrated military command in 1966, saying it undermined France's sovereignty. Critics say France will now be no more than "a clone of Great Britain". But Mr Sarkozy said there was no sense in France - a founder member of Nato - having no say in the organisation's decisions on military strategy. "This rapprochement with Nato ensures our national independence," said Mr Sarkozy. "To distance ourselves would limit our independence and our room for manoeuvre. He went on: "We have to be progressive. A solitary nation is a nation that has no influence whatsoever. "We need strong diplomacy, a strong defence and a strong Europe." He said Nato remained a central element of France's security and defence policies, but stressed that he would not give up the country's independent nuclear deterrent. Mr Sarkozy is expected to formalise the move with a letter to Nato before the alliance celebrates its 60th anniversary next month with a summit in the French city of Strasbourg. Nato Secretary General Jaap de Hoop Scheffer warmly welcomed Mr Sarkozy's announcement. "[France's] full participation in all the civil and military decision-making and planning processes cannot but strengthen the alliance further," he said. Correspondents say France's "independence" from Nato is dearly treasured by many French, and Mr Sarkozy's move has provoked a furore among those who worry it will now have to bow to US dominance. If tomorrow, we integrated into Nato, would we, could we, maintain the position that we have done on Iraq? The great fear, says the BBC's Emma Jane Kirby in Paris, is that France will now be at the beck and call of the US, and may well be dragged into conflicts in which it did not want to be involved. "Nothing today justifies returning to Nato military command," said the leader of the opposition Socialists, Martine Aubry. "There's no hurry, no fundamental need, except for this Atlanticism that's becoming an ideology." 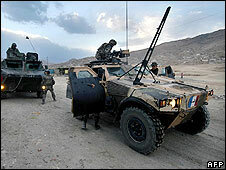 But Defence Minister Herve Morin rejected claims France would now be forced to go along with the US on issues like the war with Iraq, which it vehemently opposed. Germany, he noted, has remained fully integrated in Nato yet opposed the war. Renewing France's relations with Nato "will benefit the alliance, benefit Europe and benefit France", Mr Morin said. "It will be done without calling into question the independence of France." Indeed, it would allow France to take a greater role in shaping military strategy, he argued. Javier Solana, the European Union's foreign policy chief, said France's re-entry into NATO would benefit security in Europe. "I think it's very important that France returns to the alliance completely," he said. "I think for those who believe, as myself, that there is a need of having a capacity, a military capacity, within the European Union, it's a very important decision that France is going to take." The US also reacted positively to Mr Sarkozy's announcement. "We are delighted that after a 43-year absence, France is back where it belongs, in the command structure of the alliance it helped found," said Pentagon spokesman Geoff Morrell. "Although their troops have been bravely fighting alongside ours in Afghanistan, it is welcome news to have them fully re-integrated in all Nato military matters." While in 1966 France withdrew from Nato's decision-making core, its nuclear weapons structure and planning committee, it never left the alliance itself. Indeed, it has been one of the most active members, supplying troops under allied command in Bosnia, Kosovo and in Afghanistan, where it has suffered significant losses. Analysts say France has actually been gradually moving closer to the heart of Nato since the end of the Cold War.